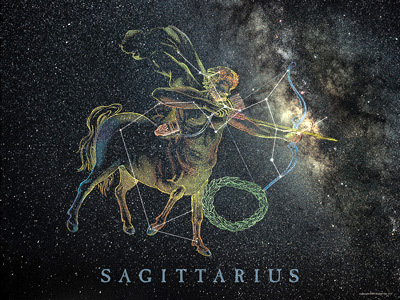 Item number DS409 - Sagittarius - Image © Digital Sky LLC. Sagittarius is depicted as a centaur, half man and half horse. The centaur is seen pointing a bow and arrow at the heart of the scorpion. The most recognizable stars in Sagittarius form an asterism often called "The Teapot" because it resembles tipped teapot ready to pour. Sagittarius is rich with nebulae and star clusters and contains more Messier objects than any other constellation.